About halfway down South Uist, you will see a turn to Bornish and there is a track south from Bornish leading to a standing stone. When the tarmac road reaches the coast look for a grassy track that leads to the shore. Park here and the stone can be seen on the skyline to the south. Walk along the beach to reach this thin gneiss pillar about 1.6m high set on a low mound. 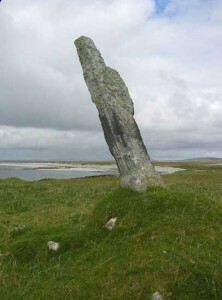 On the southern coast of the island, a standing stone can be seen close to the shore near the Polachar Inn. Thought to date from the 3rd millennium this stone stands at a height of some 3m above high water mark. It is an irregularly shaped prism, measuring 1.72m in height and 1.5m in girth at the foot.